Amazon.com description: Product Description: This text enhances the fields of early childhood education, early childhood special education, and the âblendedâ field of both by assisting in the preparation of professionals for inclusive teaching and learning environments. This text, with chapters contributed by leading experts in the field,Â provides an overview and rationale for inclusive education, methods for early childhood education and early childhood special education, foundations in content area material (e.g. math, language arts), and instructional strategies (content specific accommodations and modifications).Â Because students need to understand the theoretical framework for the knowledge, skills, and dispositions necessary to serve the needs of all young children (those who are typically developing as well as those with delays or disabilities and those from diverse backgrounds), this text will provide a resource for teaching and learning this information. 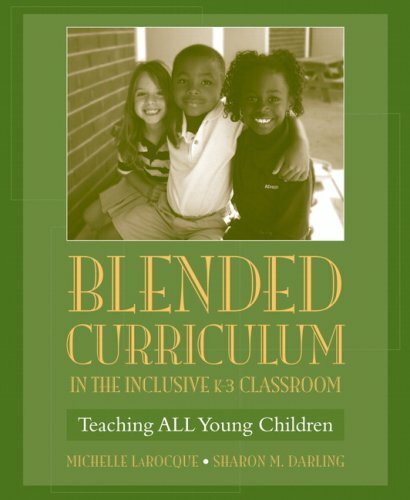 About: This text enhances the fields of early childhood education, early childhood special education, and the “blended” field of both by assisting in the preparation of professionals for inclusive teaching and learning environments.